We enjoyed our annual Christmas Potluck! Our Challenge was to make a quilted Christmas stocking! Aren't these lovely? The IVQG photographer was absent this meeting, but we can assure you that much fun was had! We had a great time sewing with our friends all day! Shelley taught an EPP class and we ordered lunch from Rosati's! 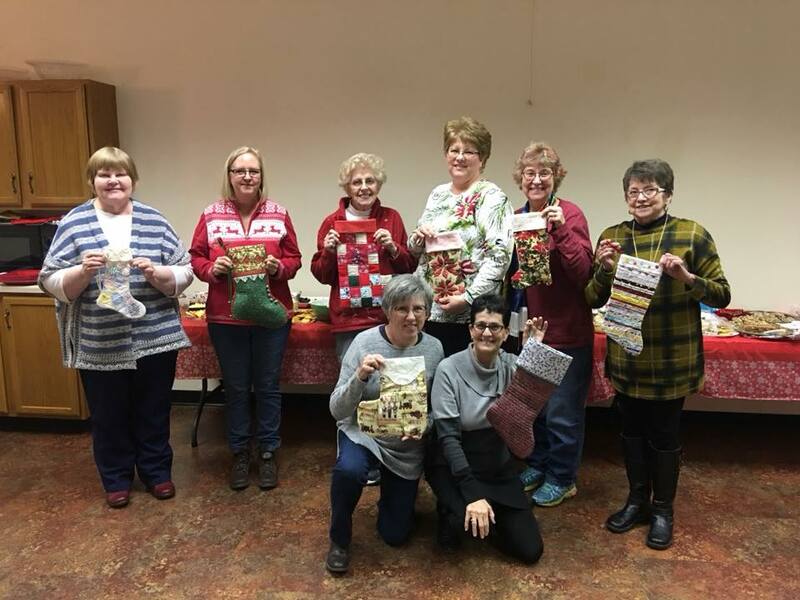 Peace and Appliqué Too gave a presentation to our guild this month! Fun times with quilty friends! Mickey Depre presented an entertaining lecture, "Me, Myself, and I." We love getting together with our quilty friends every month! We had a lovely dinner at Hank's Farm Restaurant for our annual Installation of Officers meeting! We had some beautiful entries into our annual quilt challenge as well! We have already started planning our 2018 Quilt Show, "Stars of the Valley." Our committee chairs met over brownies and iced tea to brainstorm some awesome ideas for the show. Stay tuned for more detail in the coming months! We had a great time sewing baby quilts together for the Ottawa hospital! The Quilt Merchant presented an entertaining trunk show and program! It's always fun to see our friends each week and enjoy the delicious refreshments made by our hospitality crew! Our Block Lotto blocks were awesome this month! Congratulations to Chris Hasty for winning them! Monique Dillard of Open Gate Quilts presented an awesome trunk show and program about her beautiful fabric designs. We love getting together at our monthly meetings! Janette Dwyer presented an entertaining program and trunk show! We always have a great time seeing our friends each month! We love our new meeting venue at the Ottawa Historical and Scouting Heritage Museum! Our own Elaine Templeton had her Dear Jane quilt featured at the International Quilt Festival! Isn't it great? We are so proud of her! We had a great time shopping all day at the numerous vendors and looking at the incredible quilts on display! Beth was excited to meet Mary Fons! Thanks to the Pieces from the Heart Quilt Guild in Morris for arranging the bus trip to Rosemont! We had a great time at our annual retreat at Pilgrim Park! We sewed, played games, ate lots of good food, won fabulous prizes, and laughed a lot! We met at the Ottawa Historical and Scouting Heritage Museum to sew and had a wonderful time! Susan Knapp of The Quilt Branch presented a wonderful trunk show! Carol Betts was the lucky winner of the six block lotto blocks! Valerie Savage and Sandi Sohm enjoying the program!